Personalized Sports Duffel Bags Custom Embroidered or Printed in Bulk or Blank. Promotional, Inexpensive. Budget Prices in USA and Canada. Red, Yellow, Gray, Orange, Royal, all with Black. Free Embroidery Tape for orders of 40 or more. 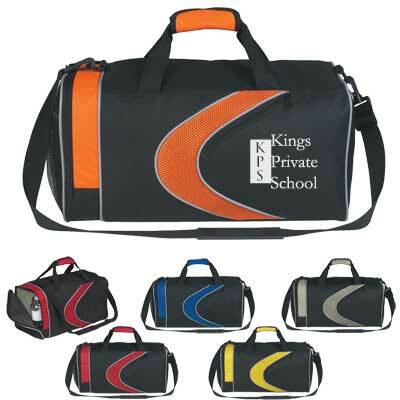 Bulk custom imprinted sports duffel bags made of sturdy 600D polyester. We also supply wholesale blank (not imprinted) Sports Duffel Bags. Budget Prices in USA and Canada for wholesale promotional Sports Duffel Bags. American clients pay no taxes.